True-bypass pedals are great. They don’t alter your tone when they’re not in use. But if you string a lot of them together, your tone will suffer. And if you throw long cable runs into the mix, the problem is even worse. So what can you do? Xotic’s Super Clean Buffer to the rescue! The SCB acts as a defibrillator for your tone. Its built-in high-performance preamp is built around the famous JRC4558 chip to ensure a classic sound. Its buffer circuit employs a discrete design, and it yields an open, wide spectrum of tone. 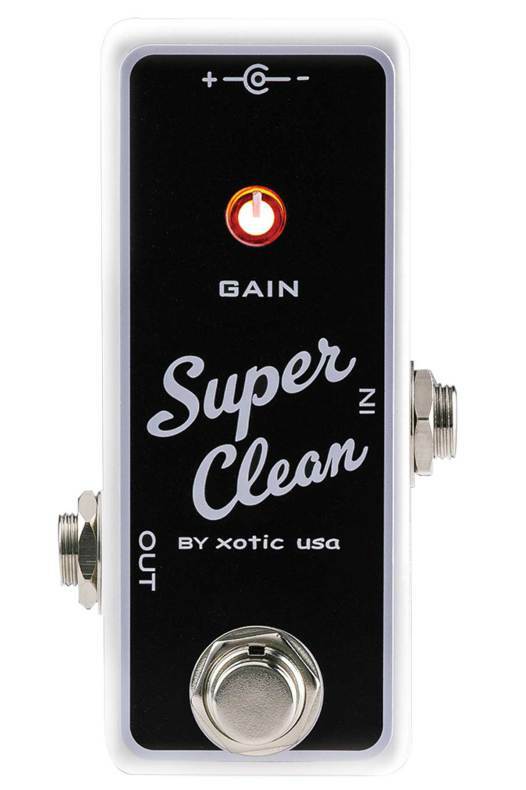 Beyond that, it boasts a rich-sounding +12dB clean boost with a selectable boost frequency. Want to improve your tone? Get a Super Clean Buffer — it’s that easy. Xotic was born in a small garage in Southern California in 1996 and quickly became known for high-quality boutique bass guitars and bass preamps. These days, they’ve expanded the pedal line, crafting stompboxes that are played by some of the finest guitarists in the business. Their acclaimed AC Booster, RC Booster, and BB Preamp pedals remain some of their most popular pedals.